Mind Maps are the ultimate thinking tool to unlock you and your staff's brainpower; representing information and ideas in a non-linear manner brings clarity, improves recall and aids prioritisation. If you have lost sight of your organisational goals, or your bigger business picture has become blurred, Mind Maps will provide an overview of the situation that brings clarity and potential to the forefront. By using Mind Maps, major blue chip companies such as Boeing and BP have already found that they can make huge savings - in some cases cutting as much as 80 per cent of their overall expenditure. In addition to increasing the speed and efficiency of planning, Mind Maps overcome the usual memory-loss curve, whereby 80 per cent of the detail you have learnt is forgotten within 24 hours. Reviewing Mind Maps at regular intervals ensures that everything learned is both retained and utilised by your brain. Meetings hosted on-line or at your facility in person. Unleash the power of group thinking. Increase focus on, and coordinate action toward, competitive strategies. Understand the factors driving your business and where the risks lie. Layout clear business objectives and insure consistency in effort. Optimize Investments and Resources for the greatest efficiency and productivity. Identify and mitigate organizational and IT weaknesses. Here are many varied reasons Mindmapping is so effective. Mind Maps really come into their own for encouraging creativity and enabling you to generate new ideas in brainstorming sessions. The spatial layout helps you gain a better overview and makes new connections more visible so you can create an infinite number of thoughts, ideas, links and associations on any topic. Students perceived Mind Mapping as a fun, interesting and motivating approach to learning. Several students attributed the fun aspect to the opportunity to be creative when creating Mind Maps through lots of choice in colour, symbols, key words and design. Mind Mapping has been shown to increase student confidence and sense of skill in mastering assigned materials. Executive's using only Mind Maps for presentations were able to handle challenging questions with confidence. They had better recall of the information because it had been captured and stored in an integrated, radiating manner rather than linearly. They could internalise it better because it was their unique representation of the information. A study by The Wharton School proved the benefits of utilising visual elements in presentations and tightly integrating them with words. Presenters who used visual language were perceived by the audience as more effective – they were clearer, more concise, more interesting, more professional, more credible and better prepared. In a Mind Map, information is structured in a way that mirrors exactly how the brain functions – in a radiant rather than linear manner. A Mind Map literally ‘maps’ out your thoughts, using associations, connections and triggers to stimulate further ideas. They extract your ideas from your head into something visible and structured. iMindMap retains this ideas-generating radial process with unique organic branch drawing. A Mind Map is an excellent tool for collaborating with others to develop plans or implement key projects. It allows you to harness the input of all members of a group in a dynamic and creative way. All ideas or statements can be recorded in an appropriate place on the Mind Map and discussed openly at a sensible time. 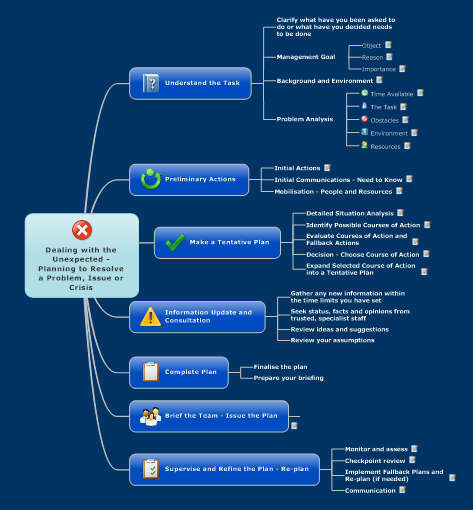 MindMaps include many collaborative tools, including a screen capture function, designed to let users communicate their ideas quickly to others. Executives prefer to work with Mind Maps in teams. This allowed them to develop synergistic interaction, assemble collective knowledge and work with a group minded attitude. The flow of communications between group members also contributed to the creative process. The Mind Mapping process involves a unique combination of imagery, colour and visual-spatial arrangement which is proven to significantly improve recall when compared to conventional methods of note-taking and learning by rote. A study found that Mind Mapping improved the long-term memory of factual information in medical students by 10%. They reported that “Mind Maps provide an effective study technique when applied to written material” and are likely to “encourage a deeper level of processing” for better memory formation. The study found that by gathering and highlighting key branches within a boundary, such as a highlight cloud, you’re using a memory technique known as chunking. Our short-term memory is on average only capable of storing seven items of information and chunking can help us use this storage space more effectively. Its flexibility also means that it possesses several uses in the classroom. Using Mind Mapping software in the classroom is a successful way to support student’s exploration and presentation of ideas. Mind Maps really come into their own for encouraging creativity and enabling you to generate new ideas in brainstorming sessions. Use of images and icons catalyse creativity. The spatial layout helps you gain a better overview and makes new connections more visible so you can create an infinite number of thoughts, ideas, links and associations on any topic. A study proved that Mind Mapping software offers a powerful approach for improving the ability of students to generate, visualise and organise ideas. The students involved reported that the Mind Mapping tool encouraged creative thinking and they became faster at generating and organising ideas for their writing. Evidence shows that Mind Mapping can be used to help you plan and organise your thinking before you start writing or get stuck into a project. You can develop all your ideas and see where they relate to each other before deciding the best way to go about things. A study by a leading University found Mind Mapping to be a useful technique for helping executives plan and structure their projects and goals more effectively. Executuves were able to improve the structure, coherence and, consequently, the quality of their written work and were able to draw value from the technique for managing practical work. A Mind Map can help you think with greater clarity to explore relationships between ideas and elements of an argument and to generate solutions to problems. It puts a new perspective on things by allowing you to see all the relevant issues and analyse choices in light of the big picture. It also makes it easier to integrate new knowledge and organise information logically as you aren’t tied to a rigid structure. Mind Maps result in enhanced thinking skills including critical thinking, whole-brain thinking and comprehensive thinking. They bring together your left brain (words, logic, numbers, linearity) and right brain skills (curves, colour, rhythm, images, space) making your brain’s performance more synergetic. This means that each cortical skill enhances the performance of other areas so that the brain is working at its optimum.